Last Christmas in Paris – ’tis the season! 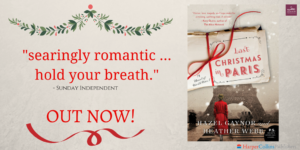 Christmas is definitely in the air after the first snowfall in Ireland last week, and it’s very exciting to see so much love coming in for LAST CHRISTMAS IN PARIS, which recently went for a 6th printing in the USA! Click play on this lovely animated video of our cover! Heather and I were delighted with a gorgeous review in yesterday’s Sunday Independent, which called the book ‘searingly romantic.’ Thank you, Sunday Indo. We totally agree! BookBub also featured us in a festive round-up of books to get you in the holiday spirit and we are especially thrilled to see the fabulous The Gutter Bookshop, Dublin (UK/Ireland Independent Bookseller of the Year) select Last Christmas in Paris as one of their Paperbacks of 2017 in their Christmas picks! Thank you, Bob & Marta! 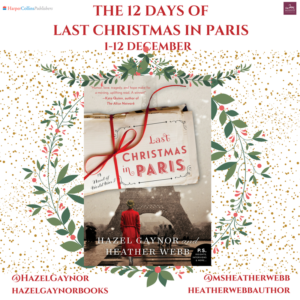 We are also very excited to announce the ’12 Days of Last Christmas in Paris’ which will start this Friday, December 1st, and will feature lots of great daily giveaways for the following twelve days, and a fabulous grand prize that we want to keep for ourselves! Keep an eye on our Twitter, Instagram and Facebook pages for details.